I will be speaking at the Gateway House of Prayer, Friday night, September 26th. The subject will be art and its place in intercession. My talk will fill in a lot of gaps in the information about my art. We cannot always clearly perceive the Hand of God in our lives and in our world. Sometimes it seems God is nowhere around, but if we had the ability to see the way he does, we would know He is reaching into our world all of the time. Often, the only way to see His hand is to back up and go low. Ezekiel had a vision of a new temple. The cherubim on the walls of the temple are unlike others described in scripture. I wanted to meditate on this particular cherub as a representation of our physical body and spirit man dwelling together. It also represents Jesus as the Son of God and the Son of Man. Many people see a map in this image. This is unintentional, but an acceptable interpretation in view of the repeated themes in my work (gates, doors, conduits, etc.). This painting represents a gate of time that God established with the land. I find it interesting that the land almost acts like and egg timer, and the gate will not open until the land receives “the Last of Your Bodies”. The rectangles represent different places in the spiritual realm. The "paths" to these places are the spaces between the rectangles. 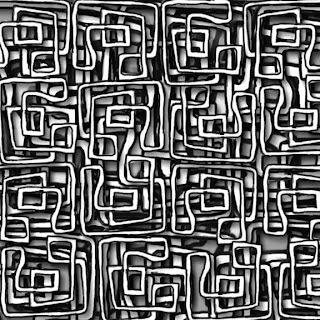 Each line can represent an intercessor, prayer, or church. They come together to form a tapestry. Conduits was painted in the Gateway House of Prayer in the Spring 2008. The repetition of lines represent the movement of power and anointing. Altars are contact points between the spirit realm and the natural. These altars can be people, churches, or houses of prayer. Whirlwind was painted over several sessions in GHOP, during the spring of 2008. The picture was immediately in my head when I woke up one morning. It represents the changes that God has brought, and is bringing, to the spiritual landscape of St. Louis. The whirlwind is what we perceive to be chaos, but the brick wall is the wisdom and order of God’s plan. Hidden Glory - This piece is a look into the way God may show up in our day-to-day lives. You can see the Glory of God in the center car. If we don't look for Him, we can miss Him. Break Up - This piece represents the moving of natural structures to reveal the spiritual reality behind them. Windows Over Cuba - This piece was painted on glass. The shapes and colors on top of the cityscape represent the unseen, spiritual reality that is over our natural reality. Bite - This piece shows my interest in teeth. My blog is definitely under construction. Soon, I will have art on display.